Why Does My Cat Attack Me at Night? 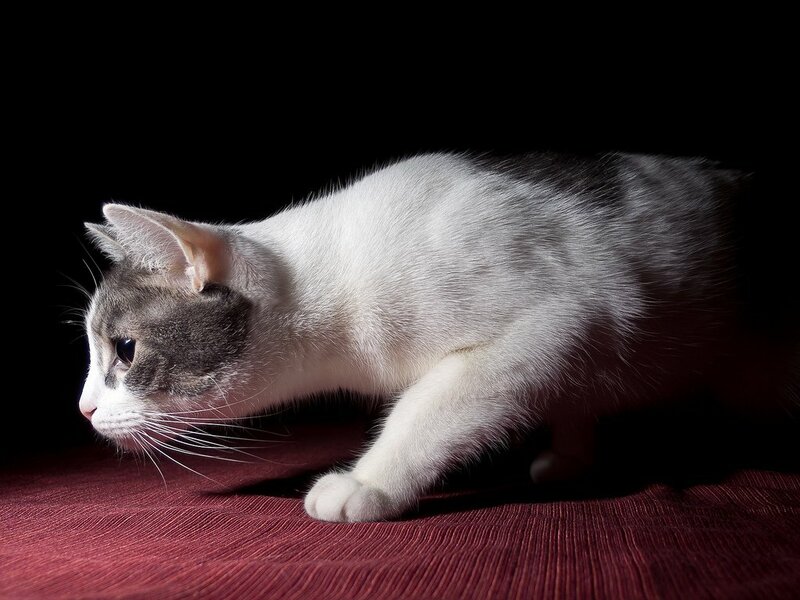 Learn these tips and tricks to keep your cat from pouncing — so you can rest easy. Cats are natural hunters, and they are really good at their jobs. The slightest movement can send them into a frenzy of desire to chase and take down whatever it is they think is prey. On top of this, cats usually hunt at night. When you are lying down, comfy and cozy in your bed, and you move your foot or leg into another position, your cat will see the movement but won’t see that it’s actually you under the blanket. Most people play with cats by moving an object covered by a blanket just to watch them pounce on it. That might have been cute when the pet was a kitten — but not so much with an adult cat who bares large teeth and sharp claws. It’s best not to encourage this aggressive behavior when the cat is a kitten, but even if you helped create it, there are ways to teach an adult cat to stop pouncing on you at night. Most cats hate water. If you have ever tried to bathe a cat, you know what I’m talking about — fur is flying and claws are flailing! Don’t Miss: Why Do Cats Knead on People? With this in mind, one of the fastest ways to stop a cat from exhibiting unwanted behavior is by using water. First, fill a new spray bottle with water. Pick one up at any dollar store. Don’t reuse a bottle that once held any kind of chemical cleaner. It can potentially harm your cat, so spend the buck and get a new spray bottle. When you go to bed, keep the filled spray bottle within reach. If the cat tries to attack you in the night, grab your trusty bottle and spritz him in the face. Follow the spray with a firm “No!” or loud clapping. Don’t give the cat any other attention after the reprimand. Every time the cat repeats the attacking behavior, spray and reprimand him. Eventually, this should cause the cat to think twice about attacking you in bed. Believe it or not, some cats couldn’t care less if you spray them and may continue their nighttime offensive on your blanketed feet. The easiest way to minimize attacks from these cats is to lock them out of your bedroom. This, of course, leaves the rest of the house open for dastardly feline antics. To combat the possibility of shredded furniture, tightly roll up a treat in a ball of yarn so it’s difficult for the cat to unravel it. Alternatively, try soaking the inner end of the yarn with tuna oil. This will keep your cat’s attention at night and eliminate your battle wounds. We all love to play with our pets, but if you’re seriously losing sleep over your cat’s attacks, don’t encourage the pouncing behavior in your waking hours while simultaneously reprimanding him at night. It’s not just confusing for him — it’s also counterproductive to the cat’s training and your sleep cycle.